Statistics Canada has added a warning to the text of its survey on gender-based violence after a complaint from a Saskatchewan woman who says she was left shaken by the sensitive nature of the questions. The agency’s Survey of Safety in Public and Private Spaces started in April and concludes in December. More than 35,000 Canadians have already completed the survey, which includes questions about sexual abuse, online harassment, violence and discrimination. But Jessica Wolff, who lives in who lives in Meadow Lake, Sask., said she was not warned about the nature of the questions when she agreed to do the survey over the phone in July. “It was the middle of the day on a weekend. I hadn’t planned on dragging up painful memories,” she said. Funded by the Status of Women Canada, the survey was developed in consultation with survivors of sexual assault and victim groups. Respondents are asked to respond online or over the phone. Statistics Canada said the voluntary survey will help inform policy, research and analysis. “Gender-based violence poses a significant barrier to gender equality in Canada,” said survey manager Julie Sauvé. “More information is needed on the experiences of those affected by it,” she said. Statistics Canada also consulted mental health professionals on the survey, she said. The online survey provides a quick exit button for participants to leave if the questions become too triggering or uncomfortable. But Wolff said the title of the survey led her to believe the questions were about “safety” in terms of injury — such as sidewalk safety. “I was completely unprepared. I had no idea what this was about,” she said. She said she answered the sensitive questions and completed the survey to the end because she feels the subject matter is important. 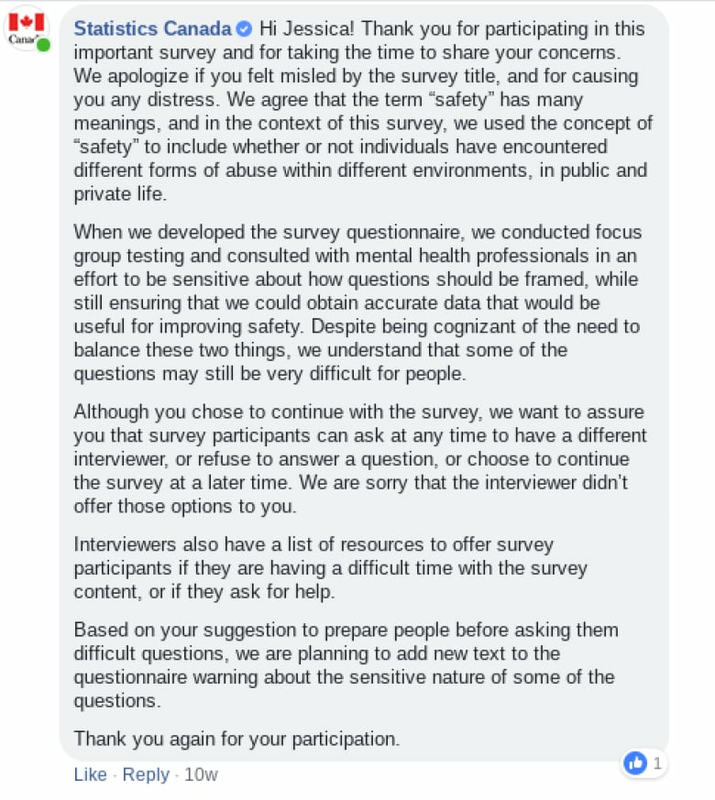 But she wrote to Statistics Canada to express her concerns that the survey did not warn respondents they would be asked sensitive questions. “I think most [women] have endured some kind of inappropriate sexual behaviour towards us at some point in our lives and the government needs to understand that it’s a reality for many women,” said Wolff. Statistics Canada added another prompt to the survey in response to Wolff’s concerns. “This additional statement informing respondents of the sensitive questions was implemented mid-August 2018 and we have received very positive feedback from our interviewers on behalf of respondents,” said Sauvé. Sauvé said development of the survey started prior to the #MeToo movement.